Media Relations for the non-profit organization presenting Philadelphia’s only rock camp for girls. Girls Rock Philly (GRP) is a non-profit organization presenting Philadelphia’s only rock camp for girls which is now in its fourth summer of teaching junior rockers, ages 9 to 17, how to rock out. This week long camp serves 80 girls from the Greater Philadelphia region, with fifty percent of campers receiving scholarships or financial aid to attend. GRP’s week-long summer day camp is held on the campus of Girard College (at Girard Ave. & Corinthian Ave.) in Philadelphia. The program culminates in an end-of-camp showcase, open to the public, this year to be held on Saturday, August 14 (location TBD), followed by a professional recording studio experience to create a compilation CD. For more information, visit www.girlsrockphilly.org or call (215) 789-4879. The Girls Rock Philly camp week provides girls with a chance to unleash their inner rock stars and to learn guitar, bass, keyboards, drums, DJ’ing and vocals. No musical experience is necessary and all needed equipment and instruments are provided. Campers form bands and write their own songs over the course of a week, allowing the aspiring young musicians a space in which to figure out what and how they want to play, while working in a team setting. The female-only environment, a rarity in the music world, provides both campers and volunteers with a comfortable atmosphere, emphasizing artistic independence and creative ownership, as well as copyright to their own songs. The camp also features guided band practice, special guest performers, and diverse workshops including the history of women in music, non-traditional instruments, sound and recording, and band art where participants have the opportunity to create original band t-shirts and buttons. The program culminates in an end-of-camp showcase performance for fellow campers, friends, family and the general public, and a professional recording studio experience to create a compilation CD. Past camp participants have come from all parts of the Greater Philadelphia area, including South Philly, Mount Airy, Roxborough, Center City, Delaware County, Montgomery County, the Main Line, and from New Jersey and Delaware. Last year, forty percent of campers returned from previous years, and the girls were supported by a diverse groups of 30 onsite adult female volunteers, including local teachers, musicians and nurses. 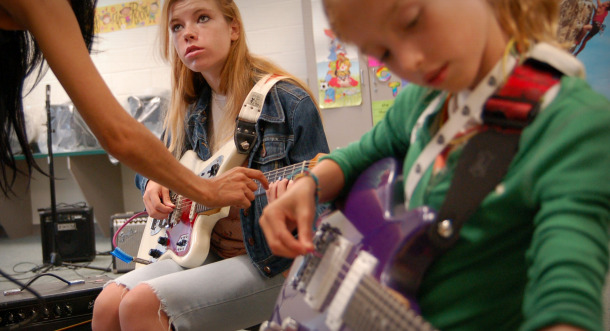 PHILADELPHIA – Girls Rock Philly (GRP), Philadelphia’s only rock camp for girls, marks its fifth year of teaching girls ages 9 to 17 how to rock out while building self-esteem through music education. The camp, which has already reached full enrollment capacity, is held August 8 – 12 on the campus of Girard College (at Girard Ave.
WHYY piece "Girls School of Rock"
On Monday they were strangers. On Saturday they play the Trocadero. Seventy teenage girls at a rock and roll summer camp formed 14 bands. Each wrote and arranged one original song. Sixteen-year-old Alexis Smith came all the way from Uniontown, near Pittsburgh, to spend a week playing drums at Girls Rock Philly. Typically, when one thinks of band camp, they think of nerdy high school kids wearing glasses and marching around with flutes and trumpets. No one ever thinks that band camp could be cool. Well, Girls Rock Philly is changing that. Girls Rock Philly is a girls-only weeklong day camp for girls ages 9 to 17 that is dedicated to teaching girls how to play musical instruments, write songs and, most importantly, how to rock out. For the first time ever, the great minds behind Girls Rock Philly are allowing their (slightly) older sisters some time in the spotlight. Over Memorial Day weekend, a group of eight women, 19 and up, will form bands, write songs and, at the end of it all, perform in front of adoring fans at a culminating Tritone showcase, all proceeds of which go toward the summer camp. Hopper is particularly optimistic about the prospects of the incoming class of girls who will enter Girls Rock Philly on Aug. 3. The camp, which is held at Girard College, was started in 2007 after Warshaw-Duncan discovered the Rock N’ Roll Camp for Girls organization through a link on Hopper’s blog. For seven days of camp, female volunteers foster the talent of aspiring female musicians by helping them to form bands, write songs, and explore new instruments.